I enjoy gardening and stocking up on meat when it's marked down, so I wanted more freezer space for these purposes. I wanted the upright so I could see what was in my freezer better for organization purposes. So I wasn't digging around for food, and not able to see what I had in my freezer like most chest freezers. Also I know this isn't as big of a concern anymore, but I heard with the chest freezer little kids used to get stuck in them ( I think this might have been in the past, but you can never be too safe). The downside to the upright freezer of course is the cost ( they are more expensive then the chest), they use more energy then the chest freezer ( although this is still an energy efficient freezer) and sometimes it can get a little loud. I love this freezer though and it has been a worthy investment for us. I have been able to freeze tons of freezer meals, vegetables, meats that were on clearance etc. Our freezer is a little different then the one pictured, ours has a touch screen on the front to control the temperature which is awesome. The freezer also came with a key which is nice to lock kids out if they are trying to get treats. We have locked ours before because our neighbor's have a similar freezer and their son accidentally left the door ajar trying to get a popsicle and most of their foods thawed out and were lost! So be careful, but this overall is an awesome freezer. I bought the Frigidaire 20.5 cu ft Upright Freezer to use to store all my garden vegetables and orchard fruit. I knew I wanted an upright and not a chest freezer as I did not want to have to rummage from top to bottom to get things out. My grandmother had a chest and it seemed the food on the bottom was hard to get to and sometimes went unused to the point it was pitched out. Not one for waste and dealing tedious storage I shopped for an upright. The Frigidaire model is very large and spacious. It has shelves inside the refrigerator and in the doors. 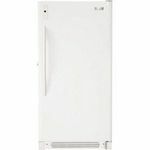 The Frigidaire freezer keeps my food frozen and everything we have taken out so far has been very good after thawing and cooking. 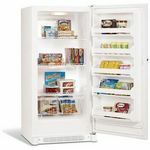 I have this freezer in my garage and it appears to run efficiently and quietly whenever I go to store or retrieve food I bought the freezer in white, moves easily and it appears to be a good freezer. 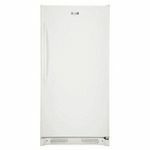 We have several freezers in my home and one of our favorites is the Frigidaire 20,5ft Upright Freezer. The door has quite a few shelves on it which allow for lots of extra storage. The freezer itself has plenty of wire shelving which allows for a good amount of food to be stored. We like to make pies, casseroles, and other dishes to freeze for winter when the harvest is in. We also like to pack bags of fruits during peak season for use in the winter when food is expensive. This freezer has been a great performer for about 5 years now. Temperature Control Consistent temperature makes this unit a great performer. We have only had problems with temperature if someone leaves the door open, as the unit is in the basement and we are not always there to be alerted to an open door. Capacity Plenty of capacity for freezing food. It has to be re-organized every now and then as there needs to be circulation room around each shelf and when you are in a hurry it is easy to over pack the shelves if not careful. Ease of Cleaning No sweat! This is a frost free unit, and if you don't leave open the door, it will perform nicely. As I said above, we have this in the basement so we are not always around to be alerted if the door is not completely closed. Cleaning other than that is not hard at all. Durability After five or six years this freezer is still going, I would say that far out performs another chest freezer we had in the past which only lasted two years! Design I love the flexibility of this freezer. It allows me to choose how I will stack or organize the shelves, so I can put in huge turkeys or lots of small bags. This freezer is very user friendly and I like it a lot. We had a hard time deciding between and upright and a chest freezer and I so glad we went with the upright. It is so much easier to access your items. One of the many things I love about this freezer is that storage compartments. In the bottom there is a pull out drawer which works great for storing your meat. The door has several shelves including one that is enclosed specifically for ice cream and to keep it from icing over. The door has a great seal to it, so much that after you open it and go to open it again immediatly after closing you have to really pull hard. Other than those instances the door opens very easily. I am glad I got his size, I still have lots of room to add more frozen food, but enough that I think anything smaller would be completly filled at this point with no room to grow. This Fridigaire keeps all my drinks Ice Cold in the summer! Previously I had a Kenmore side-by-side freezer and it was defective. It only kept my drinks cold in the winter. Once summer rolled in my drinks were only mildly cold. The freezer didn't work properly. The design was flawed. So I bought a Frigidaire upright freezer. I also bought it with a warranty in case it malfunctions. It has been working well for the past year. Even in the blazing summer heat it keeps my beverages, beer, soda, and water ice cold. 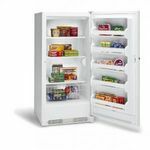 The upright dual-door freezer is a better design than the side-by-side design. It is more time-tested and works better and lasts longer. I expect my Frigidaire freezer to last a really long time. The time when you test how good a freezer is during the sweltering summer heat. This Frigidaire freezer definitley passed the test. 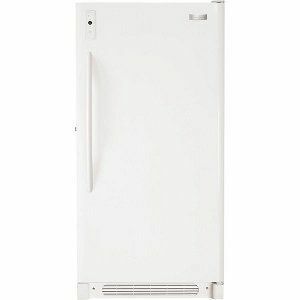 I would recommend it to anyone looking for a high quality freezer, especially now that summer is almost here. I love this freezer. I was hesitant to get an upright freezer as opposed to the chest kind of freezer. I wanted the convenience of the shelves rather than having to dig to get stuff not to mention bend over and hurt my back. I had heard that upright freezers are not as efficient as chest freezers, but this one is very efficient. It is energy star qualified which was an option I was insisting on, to ease my conscience since I know it is efficient. The freezer cooled quickly when I first got it. I love how the cooling comes right from the racks. That is a very neat feature. I have a separate shelf for beef, chicken, and pork products, as well as plenty of room to store bread. 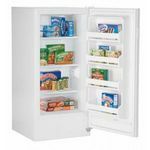 This freezer makes it easy for me to go to the store less and still have many items at home with which to plan my meals. I had to get used to the little hiss for the cooler turning on after I shut the door back up. It scared me at first but aside from that little sound it is so quiet!